A new arrow-slim, searingly fast displacement yacht is propelling Mangusta into the transatlantic market. Cécile Gauert reports. In an industrial area near Pisa, Italy, lies Overmarine Group’s next generation of metal yachts. The name of the new 54 metre flagship fits like a glove – the first Mangusta GranSport 54 is called El Leon, and this beast can really roar, with a top speed of 30 to 31 knots. El Leon looks like a Mangusta on steroids: leaner, more muscular and aggressive. It would be easy to focus first on the exterior design, penned by Alberto Mancini in close consultation with the shipyard. 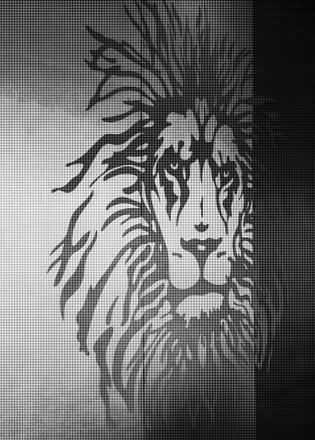 The rush of fluid lines with a sharply slanted windshield looks potent – a lion lying low, ready to pounce. However, the story of the GranSport really starts with the rise of a new generation of boaters and a very capable aluminium hull developed to cater to them. 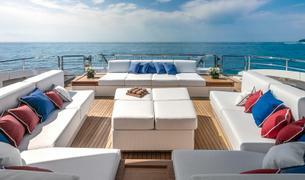 “In our opinion, the idea of yachting is changing,” says Francesco Frediani, Overmarine Group’s commercial director. “There are first-time buyers who have a different perception of boating. They are younger, are sensitive to technical issues, but more than that they want to live an adventure on board.” In other words, they don't necessarily want to stick to the familiar yachting Meccas. They want to be able to go everywhere. 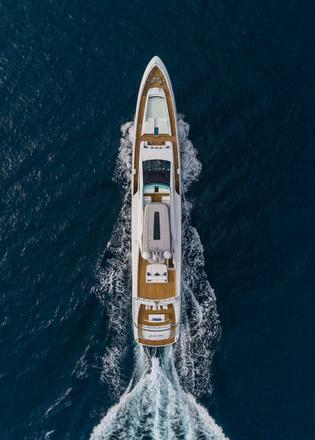 Over the years, the builder has made enormous strides in extending the cruising range of its Mangustas, which started as luxurious express cruisers ideally suited to port-hopping around the Mediterranean. By 2014, it had perfected its Mangusta 165, built in composite, a formula that included quadruple MTU engines and Kamewa water-jets for improved efficiency and increased range. However, transatlantic capability remained out of reach; to get across the Atlantic, Mangustas had to travel on a transport ship – and plenty did, as the jet- or Arneson-driven boats are ideally suited to cruising in the Bahamas, for example. Overmarine’s first stab at building displacement-type yachts was the Mangusta Oceano line. The builder tapped a young Italian designer, who worked well with the brand’s DNA. The first yacht born of the collaboration with Mancini, the Mangusta Oceano 43, was the yard’s first metal yacht in decades, although the company’s CEO, Maurizio Balducci, has long experience of building boats in metal. When Overmarine Group built its new sheds near Pisa a few years ago, it was precisely to expand its metal-building capability with the goal of building larger yachts. About five years ago, the yard started toying with the idea of a sort of hybrid between a displacement yacht and a Mangusta; a boat that would be fast as well as transatlantic. “We are strong believers in the Maxi Open concept,” Frediani says, “and we wanted to combine in one concept our experience in fast, high-efficiency hulls with the ability to go long distances while maintaining high performance and comfort – a real fast displacement yacht,” one as comfortable at top speed as it is capable of crossing the Atlantic. After studying the existing options for this fast-growing segment, Mangusta decided it needed to develop its own hull as few, if any, satisfied the top-speed requirement, without compromising on other specifications, such as beam. “It is a dream for a designer, because it was making the yacht sleeker,” Mancini says. “What I had in mind was a sword. I tried to strike a balance between sporty and elegant." The shipyard started with basic parameters: it wanted to develop a yacht between 45 and 50 metres and under 500 gross tonnes. Although the experienced builder has extensive in-house engineering expertise, it enlisted Pierluigi Ausonio Naval Architecture (PLANA), an Italian firm well versed in designing hulls for the navy, to achieve its performance goals – a top speed of 30 knots and a transatlantic range at 11 to 15 knots. What the yard added to PLANA’s hull form was its expertise in quadruple-engine packages. Like the Mangusta 165s, the GranSport 54 packs quad MTU 16V 2000 M96L, or four times 2,600bhp, coupled this time with shafts and propellers. Smaller and lighter, the new-generation engines are also more efficient. Tank testing and CFD analysis returned excellent results. “Only at that point did we start looking into the lifestyle aspect and the design,” Frediani says. Overmarine wanted to incorporate several of the features it had implemented on the Mangusta Oceano line – a beach club, a large flybridge, lots of glass and a forward lounge with a 1.8-metre deep pool. Mancini had started working on a 45 metre version along these parameters and says he was delighted to see the length grow, allowing him to push the envelope in terms of styling. 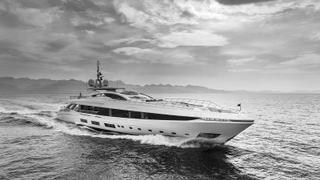 “It is a dream for a designer, because it was making the yacht sleeker,” Mancini says. “What I had in mind was a sword. I tried to strike a balance between sporty and elegant, and incorporate the Mangusta feel into a raised pilothouse [RPH] yacht. I think it is one of the longest RPH ever built.” There was a worry that extending an RPH design to that extent would make the yacht too streamlined and low. “The wheelhouse is very angled, but when you get in and sit down, it feels like a Lamborghini.” This, he adds, inspired the first owner, who was looking for a sporty yacht, to show interest in the project. In the car world, GranSport is synonymous with high performance and comfort, and herein lies one of this flagship’s achievements. In spite of its slender profile, once on board it feels extremely spacious in every direction. The flybridge, says David Bigotti, from Overmarine Group’s interior department, was the most challenging to build in aluminium. It comprises many welded pieces to achieve its sculptural shape. It is also well protected with visually pleasing aluminium curves and glass inserts in its mid-section and, at 100 square metres, has room for yoga and a dining area under the hardtop. The design ensures that even seated at the dining table, everyone can still enjoy water views. A spacious outdoor lounge overlooking the shallow pool is at the bow, matched by a spectacular 70 square metre beach club opening on three sides and a relaxed outdoor saloon aft on the main deck. Inside, the ceiling height is comparable to that of any displacement yacht. 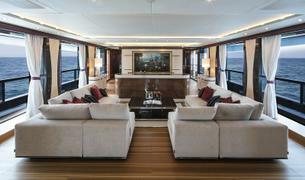 “On each deck, I pushed the engineer to get as much height, and we have 2.6 metres in the saloon above the dining area. I used lots of tricks to achieve this,” Mancini says. Some of the apparent volume results from features such as floor-to-ceiling windows in the main saloon area. In turn the use of these windows pushed the engineering department to find some creative solutions for essential equipment such as the air conditioning system. Two beautiful oval pieces of furniture, flanking the dining table, were made to conceal fan coils. 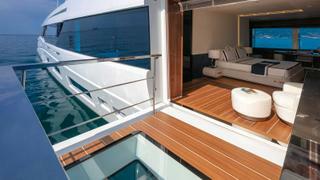 Wide teak floorboards run transversally to enhance the beam, a trick Mancini previously used on the Mangusta Oceano. 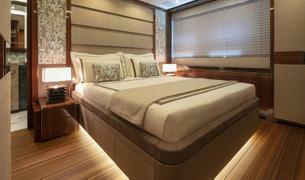 Light is also prevalent in the elegant master suite, located forward on the main deck. 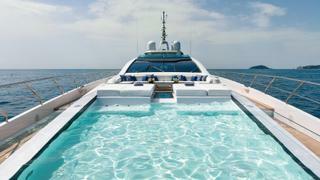 As on the Mangusta Oceano, the pool’s glass bottom serves as a skylight in the master head. In addition, the full-beam cabin has a balcony on the starboard side. El Leon's owners had many ideas on how to personalise their GranSport. Decisions that made it into the finished boat included painting the hardtop a Silver Anniversary colour by DuPont and using blue-tinted skylights by Isoclima over the exterior dining area on the flybridge. They stayed closely involved with the interior choices as well. “I trusted the clients, and the final result really exceeded my expectations as well as the owner’s,” says Mancini, who admits to a little hesitation at the outset when he discovered the owner’s fondness for glossy American nut and Macassar ebony. Wall coverings by Hermès and Rubelli combine with nubuck and other leather finishes to create a comfortably luxurious ambiance. 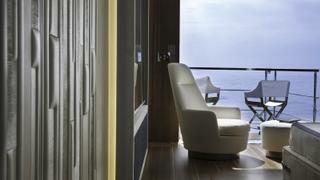 Most of the furniture is custom designed, with a few exceptions, such as twin saloon sofas by Minotti. “It is not a super-modernist yacht, but it is very appealing,” Mancini says. 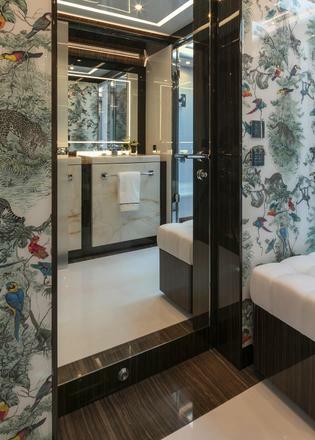 A heavily veneered brown marble, similar to wood veneer, combines with a glass-enclosed Hermès animal print wall covering in the master head to suggest the idea of a tropical forest. The owners had other requirements that pushed Mangusta towards a tailor-made layout, with an office and a larger than planned tender garage for a 7.3 metre craft designed by Mancini. Gullwing-style doors open the twin tender bays located in the forepeak beneath the pool. Custom design beyond the choice of interior materials and accessories is not the goal, however. “We have studied the project well and are able to offer many different layout options thanks to Nicola Onori and Pier Giorgio Finatti from our technical department,” Frediani says. “We have very different layout options: a four-cabin layout in the lower deck plus social areas like a gym and cinema; master cabin on the main deck; another one with two full-beam VIPs on the lower deck; plus two guest cabins and a master cabin on the main deck. The customisation is very high if the owner enters in the very early stages, and a bit less flexible when the owner comes in the later stage.” Frediani says they can’t predict how many they’ll be able to build, but construction has begun on hull No 2 of the Mangusta Gransport 54. 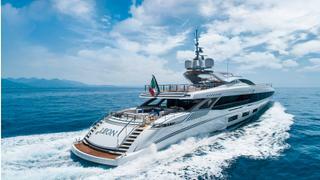 After debuting in Saint-Tropez to Mangusta fans, El Leon appeared at the Monaco Yacht Show. She has ambitious plans, possibly going to the Caribbean, doing the kind of open ocean mileage no Mangusta has ever done before. PLANA defines the Mangusta GranSport 54 hull as “fast and surface piercing”. Yacht architect Pierluigi Ausonio says it goes through the sea surface (it does not plane) but uses dynamic lift to control longitudinal trim and maintain displacement mode at high speed. Ausonio has designed fast naval vessels and worked with four-shaft arrangements and propellers since the 1980s. He has applied all that knowledge to the GranSport fast displacement hull. CFD calculations and tank testing helped refine the hull’s round-bilge shape in the aft section to accommodate the four-shaft arrangement and maximise flow to the propellers and in the fore section, which incorporates a “dynamically surfacing bulbous bow and an effective spray rail”. 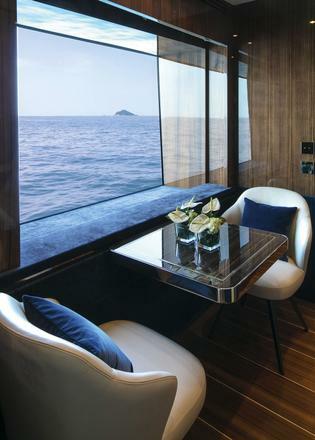 Designer Alberto Mancini worked closely with El Leon’s owners and Mangusta’s interiors department to create the stylish décor but was given relatively free rein. He enjoys incorporating features from the automotive world in his designs. There are a few on the outside of the Mangusta GranSport 54, the largest yacht he’s designed to date, but it is one interior feature, developed for luxury cars, that has him most excited. “We used a new type of veneer that allows us to create a kind of transparency. It’s a new technology by Alpi, developed for dashboards in luxury cars.